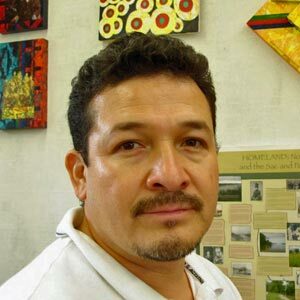 Tony Tiger (Muscogee/Sac & Fox-Seminole) is an award-winning painter, printmaker, and mixed media artist, who was born in Los Angeles, California in 1964. His artwork is shown in national solo as well as group exhibitions, for example in the Changing Hands: Art Without Reservations 3 exhibition at the Museum of Art and Design in Manhattan, New York City. In addition, he has been part of several exhibitions as a curator, among them Art from Indian Territory: Contemporary Native Art from Oklahoma at the All My Relation Gallery in Minneapolis, Minnesota. Tony attended the Seminole State College in Oklahoma and then the Oklahoma State University for his B.F.A. and the University of Oklahoma for his M.F.A. Until today, he goes back to these institutions in order to learn more about exhibiting his own art, encourage students, or to give lectures on contemporary Native American art. His art education gave him a better understanding of Western art theory, including Native and non-Native criticism. After his graduation from the University of Oklahoma, Tony became the director of the art department at Bacone College on Muscogee Creek Nation Land. Tony Tiger’s understanding and interest of color is broadened not only by his education, but also through his own exploration of color. His use of color is shaped by his boyhood observations in nature and tribal ancestor’s use of it. Furthermore, he applies color symbolic in his work. While red may be a representation of blood, passion, or sacrifice, dark blue can refer to deep thoughts. One of his latest curatorial project, titled Evolution of Color, is among others influenced by his interest in color. Tony Tiger’s paintings with bright hues of red, orange, ochre, sky blue and grass green mixed with deeper browns and purples as contrast,reveal his appreciation of the ‘wonder of color’ in nature. 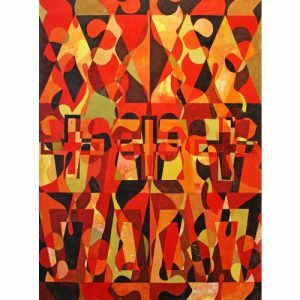 Tiger, a Muscogee, Sac & Fox and Seminole artist, is also inspired by the uses of colour in the traditional ribbon-work appliqué designs of Sac and Fox regalia and in Seminole patchwork, both of which show expressive and highly creative uses of colour.